If you can find time in your hectic life to prepare meals for your freezer you will find that you not only have a more organised life but can save money as well. Plan ahead and choose a day to spend cooking meals to store in your freezer. Plan which meals you wish to freeze and in what order you are going to cook them. Make a list of ingredients that you require for all the recipes and stock up before your planned day of cooking. Purchase fresh vegetables, meat and other goods the day before. Do use plan to use part of your cooking day for shopping unless you want to be cooking late into the night. Look at the recipes you want to cook, do they all have similar oven temperatures or cook times? Make sure that the meals being cooked go in the oven together and note what time they have to be removed. It’s all very well being clever and baking large batches – but who wants to eat overcooked meals or burnt pies? Check out how many containers you have for storing food in your freezer. Ideally they should all stack on top of each other tidily and have well fitting lids. In real life we all keep odd shaped boxes and retain ice cream tubs and other food containers. This is a cheap way of storing food but check that the boxes can be defrosted in the microwave. Ideally a plastic container should be able to not only go through the defrost programme in a micro wave oven but also be able to hold the food at higher temperatures whilst it is cooked. If you do not have or do not wish to use a microwave oven why not consider storing your meals in foil containers? These containers are disposable and have cardboard lids that can be written on. If you have access to a trade warehouse you will find that you can buy these types of containers in bulk and will save money in doing so. Label all containers before placing them in the freezer. Show what the contents hold and the date they were cooked and frozen. If your containers are all identical why not use different coloured labels for sweet meals, meat based dishes and vegetarian meals? Perhaps even go to the extent of having different containers for different types of meals so that you don’t have to unpack the freezer every time that you require a certain meal. 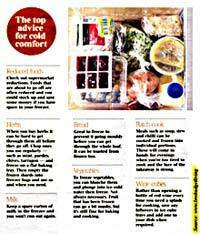 Once your freezer is packed with meals make a list of accompaniments to these meals. Yes, you may choose to have fresh vegetables but if in your store cupboard or freezer you have another variation you will not only be covered for days when you do not wish to cook but are also ready for any unexpected visitors who turn up uninvited. Keep a record of what you have in your freezer and also its use by date just in case the labels fall off your containers. Food will not live indefinitely in your freezer but, if you cook all meals for the month ahead it will make sense that when next you have a freezer cooking day you move all remaining frozen meals to the top of the freezer and use them first.